I haven't really done a WIP update in a while. I think it has been all the excitement of starting a podcast and starting to spin. Speaking of spinning, I have managed to finish plying my first Tour de Fleece 2013 project. I have got two 50g (ish) skeins of 2ply yarn. They are currently drying, but here is the result, photographed just as they were finished. Yes, my long anticipated supported spindle from IST Crafts arrived, along with an apology for the delay and a WPI gauge thrown in too. 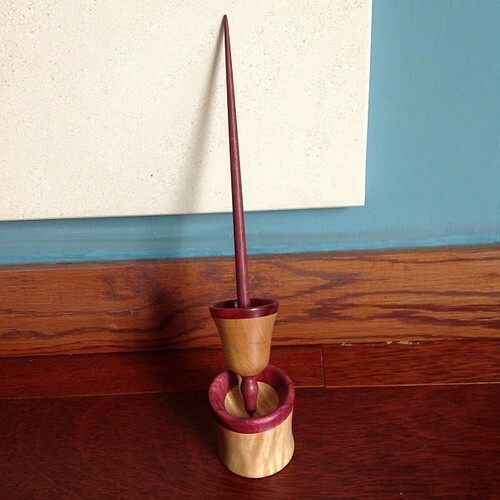 I got the Purpleheart on Sycamore with Purpleheart shaft, without a brass tip, but with a bowl. As you can see, there is no fibre on my lovely new spindle yet. That is because I am scared! I don't know why, because I have some fairly robust fibre to practice on. 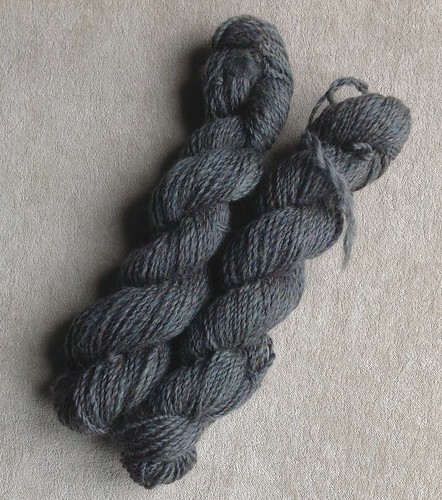 I have some Falkland fibre from World of Wool, that is undyed, which will be perfect. I think it is because I have not found many videos on YouTube. I think I will have to do some more searching. I have bought Respect The Spindle, after deciding that it was so highly recommended that even if it didn't focus on supported spindles it would give me lots of valuable information. I have only just started the book but it is really well written, clear and interesting, so I am reluctant to start spinning on the new spindle before reading more of the book. I shall have to decide soon, otherwise I won't have anything to spin for Day 5 of the Tour! So, moving on to my knitting! If you have listened to my podcast you would have heard me talk about being approached by Minerva Crafts to do a product review. I could pick a pattern that they sold on their website and make it using yarn they sold. I eventually chose a King Cole pattern, because though I have knit with King Cole yarn, I've never knit one of their in house patterns. The pattern I chose is King Cole 3324, which is for either a long sleeved sweat shirt type top, or a t-shirt with an open neck. 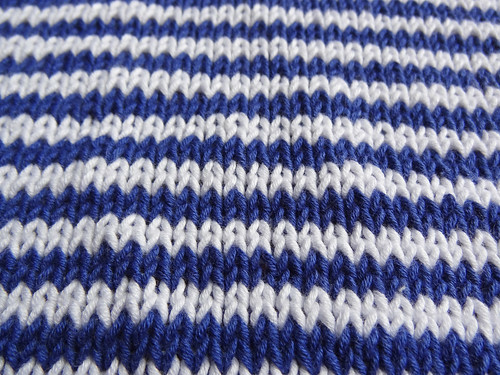 I decided I like the idea of making a nice simple t-shirt, especially as it has stripes! I chose blue and white King Cole Bamboo Cotton yarn, as I've never used that yarn. Having yarn as well as a pattern, that were new to me, felt the right thing to do if I was to give an unbiased review. I didn't want to already know what the yarn or pattern would be like before starting. I really am impressed with this yarn. 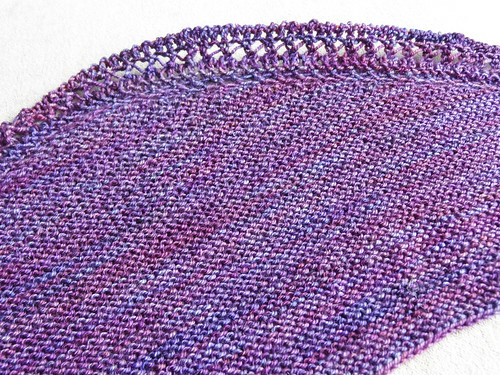 It is incredibly soft and drapey and is beautifully smooth to knit with. I did a swatch and hung it to dry with clothes pegs attached along the bottom, as I was pretty sure this fibre would grow - and I was right. The swatch before washing and hanging was no where near the gauge, but it was spot on afterwards. The fabric is beautiful when knit up, even before blocking. The style of t-shirt is very boxy and it relies on the drape of the fabric to give shape. I think this will be an incredibly light and comfortable garment to own. The t-shirt is knit bottom up and in pieces, which is pretty common for the patterns written by UK spinners, but in this case I think it is a good idea, as it will help anchor the very drapey fabric, so it doesn't stretch too far out of shape. 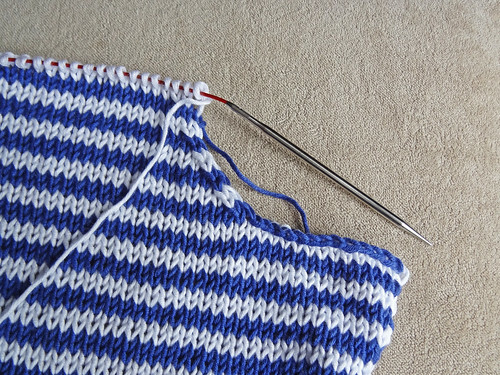 I have already knit up past the decreases for the armholes on the back and I'm really enjoying my stripey knitting. At the decreases for the armholes I carried the yarn along the back of the cast off stitches in the same way as I learnt from here, whilst starting my Tribute Wrap (I really must pick that up again, I'm half way done!). It was more tricky to use this techniquebecause the carried yarn wasn't cut, like in the tutorial, but I twisted the carried yarn one way for half the stitches and the other way for the other half. It all untangled and I think it looks pretty neat. I tried to take a full shot of the back, but my cat decided that as it was laid on the floor it must be for her. 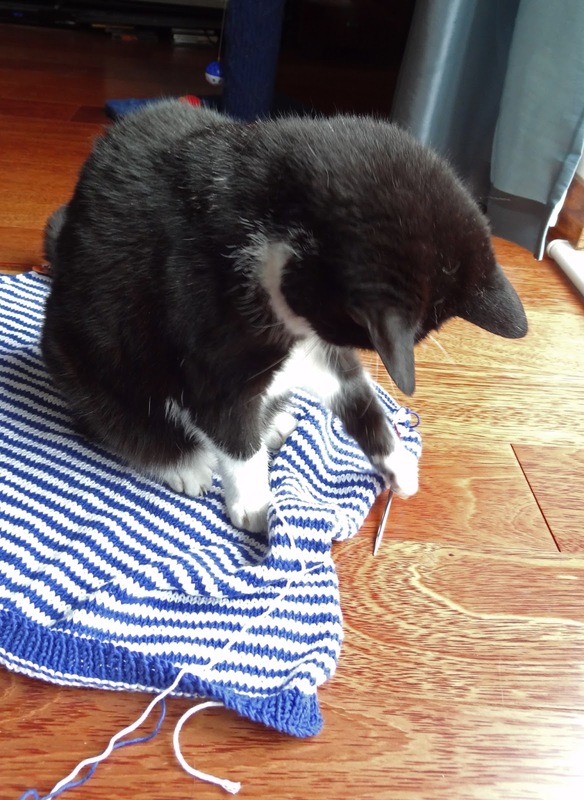 It's unusual for her to take such an interest in my knitting, but I decided that I didn't want my knitting either being shredded or dropping off the needles due to her playing with it. The other project I have started, and was mentioned in the podcast, was Henslowe. It's a lovely simple shawl pattern that I learned about from Emily of the Watcha' Swatchin' Podcast. I cast on immediately after seeing it, by using some Malabrigo Sock from stash, in Abril. I already had this yarn caked, to play around with a pattern idea I had, that didn't work out, so it seemed a perfect match for this pattern. I adore Malabrigo Sock. It's a gorgeously soft and springy merino that is so wonderful to wear round your neck. I can't imagine anyone wearing it on their feet, because I know the socks wouldn't last long with yarn this soft. I quickly knit up the centre garter stitch panel that is knit side to side with yarn overs at the beginning of each row, and then cast off the top long edge using a suspended bind off. As it was a technique I've not used before I looked it up and found a great tutorial from Bella Knitting. (I already shared that link on my Facebook Page). The technique is really easy and though Jeny's Surprisingly Stretchy Bind Off is stretchier I think that the suspended bind off will keep the edge from stretching out of shape when it is worn. I have now picked up the yarn over stitches at the end of each row to start knitting the lace panel outwards along the curved edges of the garter panel. 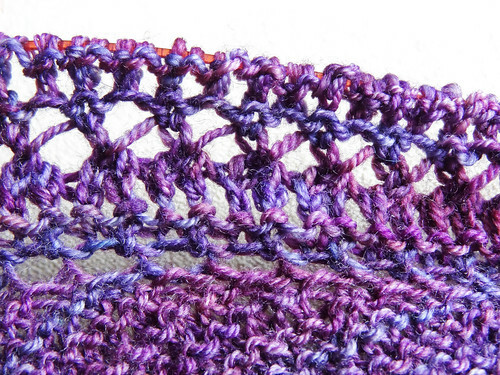 The lace is pretty easy and I was able to do it at knit night without having to rip any out. I am really enjoying this pattern and I can't seem to stop! One more thing before I go, I mentioned on my podcast that I wanted to start a KAL/CAL towards the end of the Summer using patterns from your crafting library. The idea being that everyone could choose the type of project they wanted to create, but they would be doing something that they forgot they wanted to do, when they bought either a book or a magazine. I also thought it would be a great opportunity to knit from stash, as often those long owned patterns also have yarn bought for them to knit when you "have time" or when you are not distracted by the new and shiny! I am tentatively proposing the start date of Saturday 31st August and running to Friday 1st October. 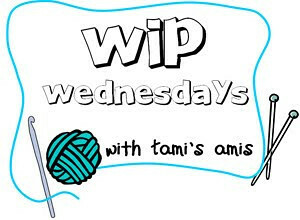 I'd love to know if anyone would want to join in with my Crafting Library KAL/CAL and if the dates would work. I am not proposing to set any particular size restrictions on the projects so you could do a baby jacket or a blanket. I would probably give (some small, probably from stash) prizes at the end of the KAL/CAL that would be drawn from anyone who posted a minimum of three photographic posts in the update thread on my boards. I think, that way, people could join in, whatever the scale of the project and not feel annoyed that their blanket or huge sweater would take longer than the baby jacket or hat, knit by someone else. I want people to work on the projects that interest them, not force them into knitting something that has to be completed by a deadline. If you are interested in taking part, or have any thoughts on what I have suggested, then please go over to the Ravelry Board and join in the discussion on the thread. And if all that wasn't enough food for thought, you can click on the button to find out what everyone else is working on!